(From Sony lens literature) Sony has introduced a new telephoto zoom lens for its Alpha A-mount line, the 70-300mm F4.5-5.6G SSM II (model SAL70300G2). Ideal for outdoor sports and wildlife photography as well as tightly cropped portraits, the lens features approximately 4x faster AF tracking than the current lens model 70-300mm F4.5-5.6G SSM. It also has Nano AR coating to minimize flare and ghosting and improve rendering, and is dust and moisture resistant. 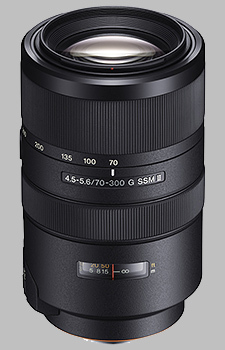 The Sony 70-300mm f/4.5-5.6G SSM II SAL70300G2 doesn't have any user reviews yet!